If you’re thinking about attending the 179th Oktoberfest, there’s still time. It runs September 22 -October 7 in Munich, Germany. Just in case you’re planning a trip, we’ve assembled some tips for how you can use Google tools like Flight Search, Hotel Finder, Maps and Transit to help you plan an amazing trip -- whether you’re using your desktop, laptop or on your Android device. If you want to figure out the best beer tents to visit, this Google Map will be a great place to turn during the event (will be live 09/22/12). When the pin over the tent is green, the tent still has seating and is open. When the pin is red, the tent is closed because of overfilling. My favorite tent is the Hippodrom, a smaller tent frequented by a younger crowd -- and recently discovered by celebrities. It offers beer -- of course -- but also has a sekt (sparkling wine) bar that is pretty stylish. You should plan on arriving early if you want to visit. You can also see live pics from Oktoberfest by clicking on various webcams on the map. This capability is very useful in providing information to help you choose the tents you’re most interested in visiting. You might also want to plan ahead and consider the crowds and traffic. 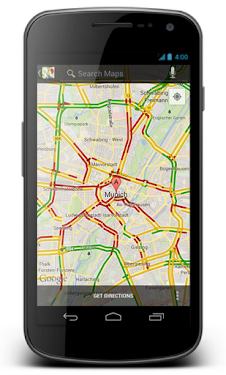 With Google Maps for Android, you can take a look at live traffic to see if you want to drive -- or choose to just walk, bike or take transit. 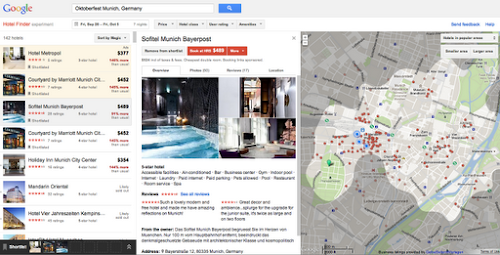 If you want to see more of Germany, you can use Google Transit to reach other cities such as Hamburg or Frankfurt. This navigation tool includes information about Deutsche Bahn (DB) trains and recommends the best transit options, taking into account various factors such as duration and number of Umstiege (transfers/stops). The options are then shown on the map, along with time, train type and duration of the trip. This is especially handy because it’s possible to click through from the transit options page, to purchase your tickets on bahn.de without needing to reenter the dates! And if you’re a non-Bavarian who doesn’t speak German, don’t worry. You can use Google Translate or the official Oktoberfest dictionary to communicate with the locals. So now that your interest is piqued, you’ll probably want to plan a trip right away. 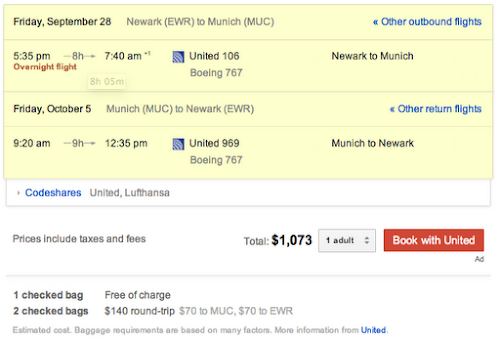 You can do so by going to www.google.com and searching for [flights to Munich]. Your departure city will be automatically recognized; mine was New York City. As you change your dates, prices will instantly update. I prefer nonstop flights, so I clicked on “Nonstop” to get a list of flight times available at the $1,073 USD price and then evaluated various attributes of the flights -- including the cost of checked bags for this ticket. Once I picked the flights that worked for me, I clicked the red “Book” button to make my booking via the airline’s website. 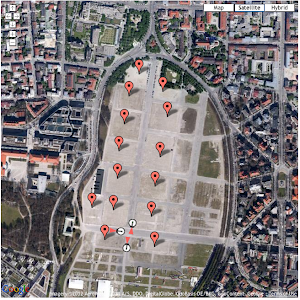 Finally, you can use Hotel Finder to find hotels near Oktoberfest in Munich. You can do this by going to www.google.com/hotelfinder and entering [Oktoberfest Munich, Germany], along with the dates you plan to be in town. You can use the reviews, images, ratings and pricing information to create a shortlist. Once I selected the hotel I was interested in, I used the red booking button which took me to www.booking.com to complete my reservation. We hope you found these tips helpful. Whether you end up hitting the Wiesn tents this October, or visiting Germany at some point in the future, we hope to help you plan your trip and connect with travel suppliers with ease.